Fibromyalgia is becoming more and more prevalent in recent years. It is estimated to affect 2% of the US population, with middle aged females having an increased risk. It is classified in the US as a “functional somatic syndrome,” which is to say a collection of physical characteristics of symptoms rather than a disease or mental disorder. The symptoms of fibromyalgia syndrome (FMS) may involve pain in the joints, muscles, skin, connective tissue, or nerves; fatigue or sleep disturbance; anxiety, depression, or cognitive impairment; urinary or bowel upset; and is sometimes co-diagnosed with chronic lupus or rheumatoid arthritis. There are often very specific tender points on the body for which pressure may be extremely uncomfortable, although in 2010 the criteria for diagnosis was revised to eliminate the requirement of tender point testing as it relates to diagnosis. Because FMS has such a wide range of symptoms, it is impossible to be sure that massage will always be beneficial for every FMS patient. In our observation, our clients with FMS will note that their pain requires massage that is either 1) extremely light or it may even be too intolerable to receive any touch, or 2) extremely deep pressure is the only thing that provides any relief whatsoever. If you are currently living with FMS, you probably know which end of that spectrum you land on. If you feel that you fall into the first category, and the pressure of massage or even just the light touch of clothing is too painful for you, it may be beneficial for you to start with hand or foot reflexology rather than a full body massage, and perhaps graduate to more and more massage at a later date. If you can tolerate your hands or feet being touched first, this may help to slowly introduce you to the feeling of pressure on your body while also working to decrease your pain and increase your tolerance of pain. If you feel that your symptoms are such that you can tolerate a hands-on session, some types of massage therapy may be very beneficial in easing some of your symptoms. Myofascial release may help to relieve pain and stiffness, while shiatsu might improve the pain intensity and increase the pain threshold. These styles of massage often utilize stretching, not just of the muscles but also the joints and connective tissues. Shiatsu also will utilize the concepts of acupuncture, with finger pressure being applied to specific areas of the body. Lastly, since FMS is often misunderstood by friends, family, and even sometimes the medical community, FMS patients may benefit from being proactive about seeking out therapy, and from finding a massage therapist who takes their pain seriously, is compassionate, and respects the limitations of their pain threshold. We hope that you will consider Rebalance Massage Clinic as a part of your pain management routine. 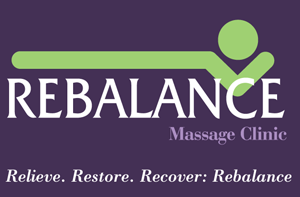 If you’d like to book an appointment, give us a call at 732-422-6364 or find us online at rebalancemassageclinic.com.